I like to celebrate the blog birthday every year by making a chocolate peanut butter dessert. Is there really a better culinary combination? The first year it was marshmallow filled molten chocolate cakes with peanut butter fudge sauce. 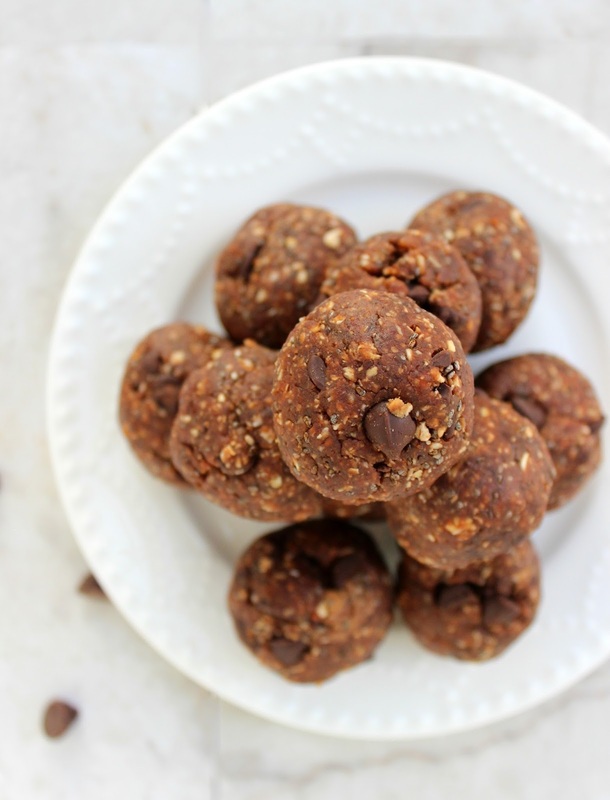 Last year it was four-ingredient chocolate pretzel peanut butter cups. 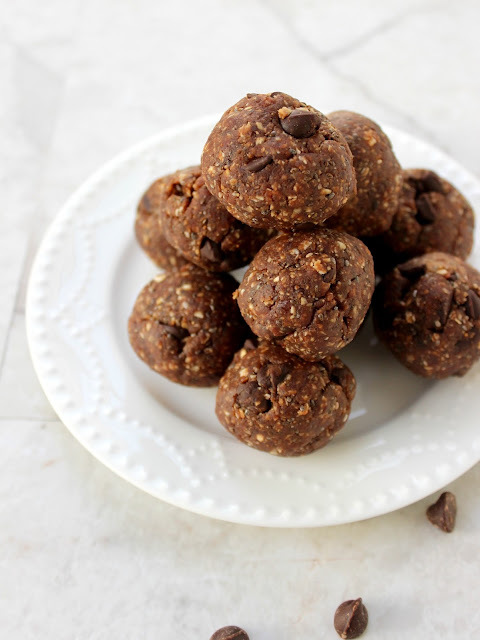 This year, I've made brownie batter energy bites--a healthier chocolate peanut butter dessert--made with dates, peanut butter, cocoa powder, chia seeds, oatmeal, and chocolate chips. But, don't let the healthy ingredients fool you--these bites are rich and packed with intense chocolate flavor. And, there's no baking involved. You'll combine all the ingredients in the food processor, make the balls, and then pop them in the fridge to set. It's hard to believe that I've been blogging for three years. THREE YEARS. I started this blog during my third year of teaching and I've continued blogging though almost three years of law school. In a lot of ways, I think it's helped keep me same. Throughout everything, this blog has been a space where I've come to play, experiment, and connect with you. Thank you for reading, and thank you for loving chocolate and peanut butter as much as I do. 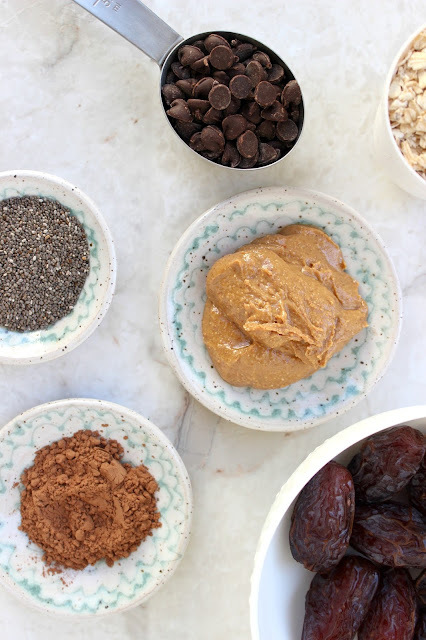 Add peanut butter, cocoa powder, vanilla extract, chia seeds, and oats. Pulse until combined. (You may need to stop and scrape down the sides of the food processor if you have a regular model like mine.) If the mixture is not coming together, add a splash of milk and pulse again. Add chocolate chips and pulse for another few seconds. You can eat these immediately, but to firm them up a bit, stick them in the fridge for 15 minutes or so. 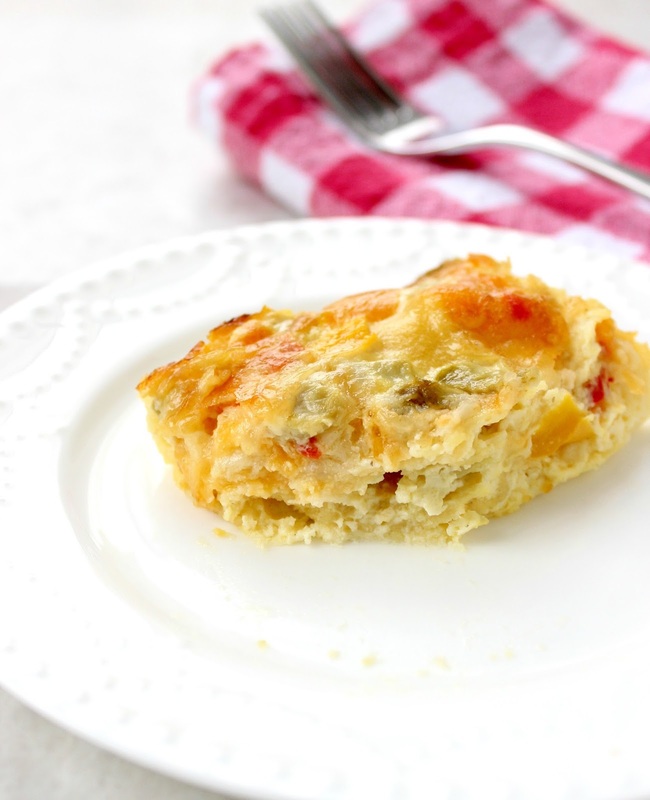 These will stay fresh in an air-tight container or in the fridge for up to a week. They can also be frozen! Most of us on the east coast have been snowed in this weekend, so we've been drinking wine and eating comfort food. 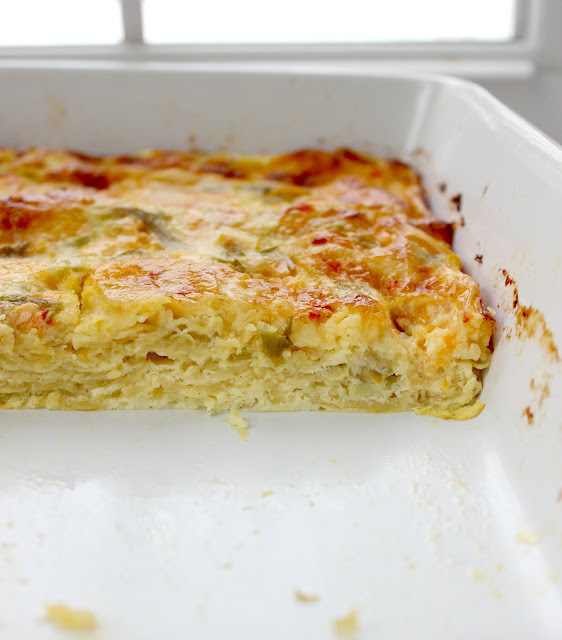 Enter this baked cheesy, eggy goodness.....the green chile strata. Adam and I didn't have a lot of groceries going into the weekend. Although Adam was able to go to the grocery Thursday night before the storm came, there were no carts or baskets left, so he was only able to make it out with milk, apples, and cereal. So, we had to feed ourselves for 3 days with with the remnants of our pantry and fridge. I actually sort of love this kind of challenge. I enjoy imagining different recipes using the combination of ingredients we have on hand. I especially enjoy it when the end result is this delicious and blog-post worthy. 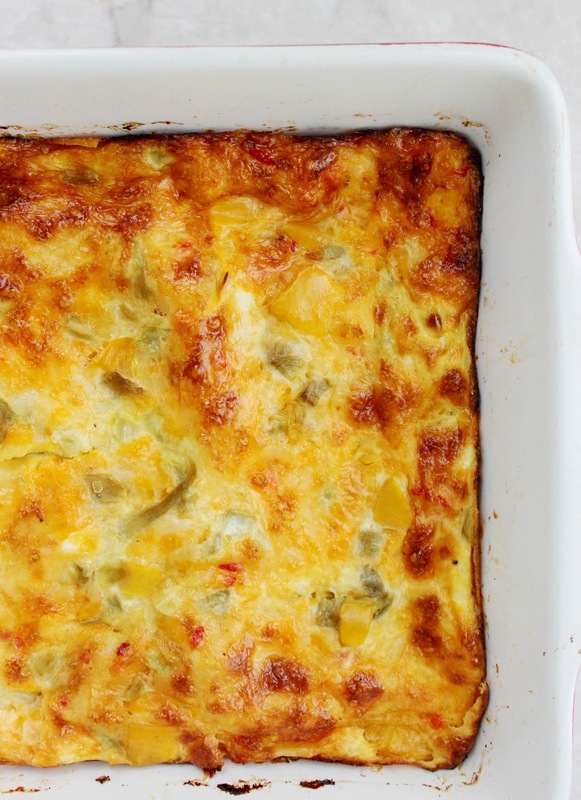 This strata is a very forgiving recipe. Feel free to add other sautéed veggies, black beans, or your favorite hot sauce. You can prepare the strata the night before and let it set in the fridge, or just refrigerate it for 30 minutes before baking. If you're anything like us, you'll be devouring half the pan within minutes of taking it out of the oven. It's that good. Grease a 13 by 9 inch pan with non-stick cooking spray or butter. Add olive oil to a small sauce pan. Add the chopped yellow pepper and sauté for 5-6 minutes or until starten to soften. Add the can of diced green chiles to the pan and stir to combine. Cover the bottom of the pan with 4 corn tortillas. (I ripped two tortillas in half and used them to fill in the gaps) Cover the tortillas with half of the pepper mixture and half of the shredded cheese. Cover the cheese with four more tortillas. Add the other half of the pepper mixture and top with the remaining cheese. 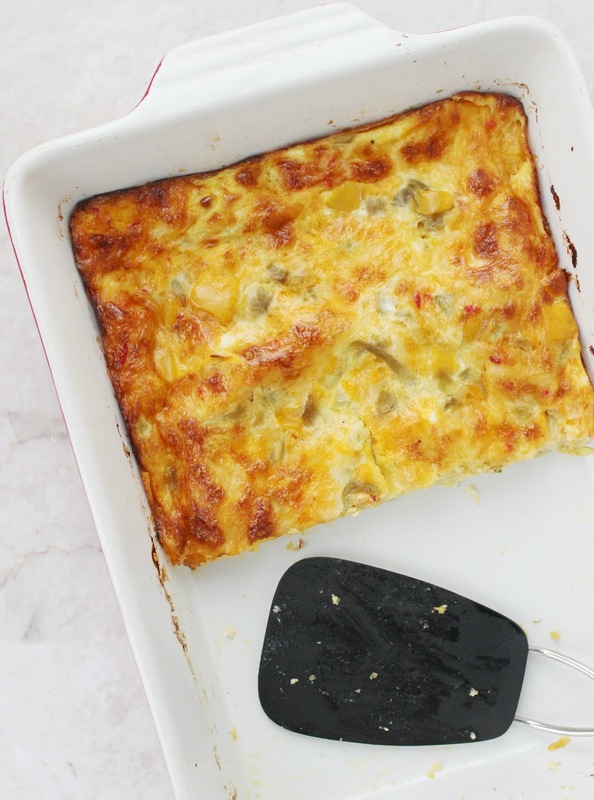 In a medium bowl, whisk together the eggs, milk, and hot sauce. Pour egg/milk mixture over the baking dish. Refrigerate for at least 30 minutes or overnight. Bake at 350 for 50-60 minutes or until the top is golden and bubbling. The original recipe calls for three 4-ounce cans of green chiles. I only had one can, so I used a fresh yellow bell pepper instead. Feel free to experiment. This is a forgiving recipe! I also used 1 cup of leftover pimento cheese in this recipe. It was delicious! 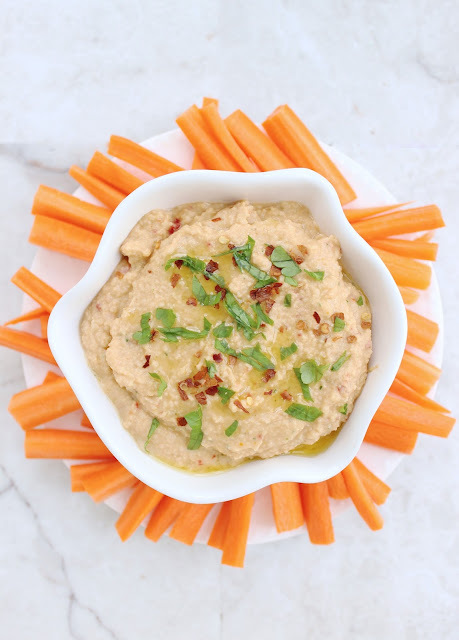 If using, consider omitting the salt, as pimento cheese is already salty. Adapted from Savor by Shauna Niequist. Hi! 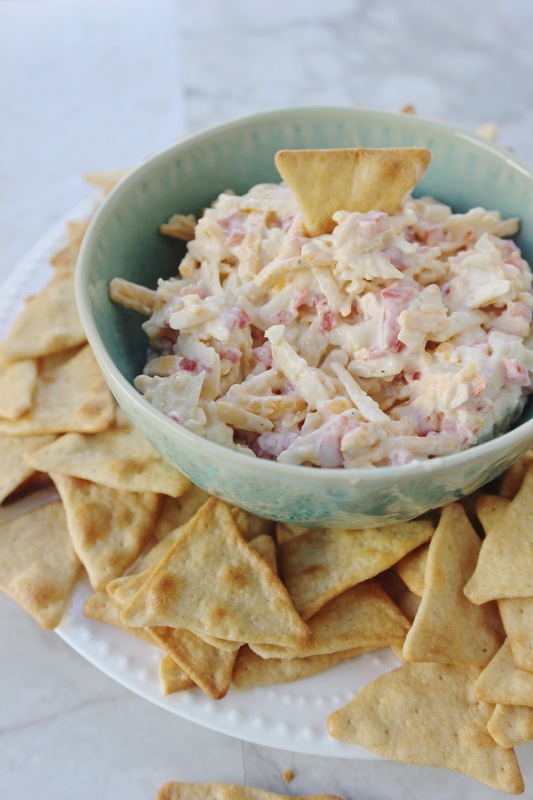 It's only mid-January and I'm already post a dip recipe made from primarily of cheese and mayonnaise. I'm pretty sure this is breaking some food blogging rules, but sometimes that's necessary. 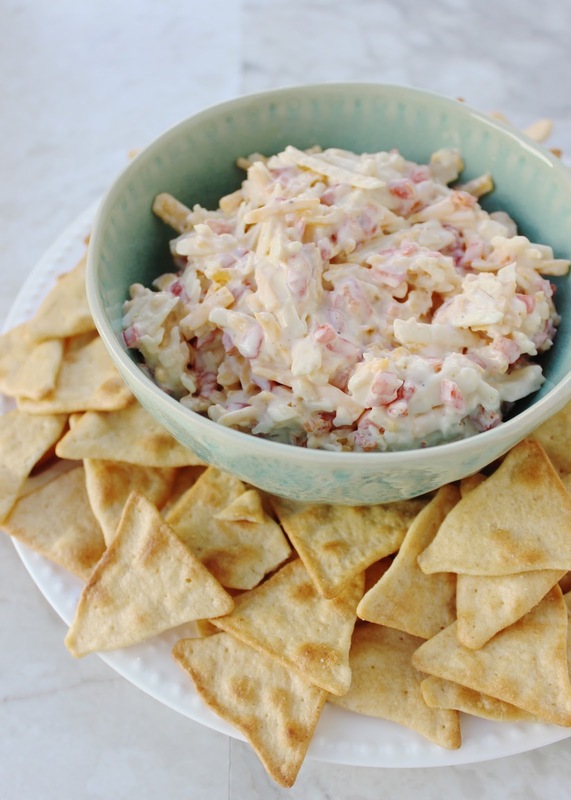 Pimento cheese is indeed a southern classic. I hated it when I was a kid because of my aversion to mayonnaise, but I've grown to love it in recent years. 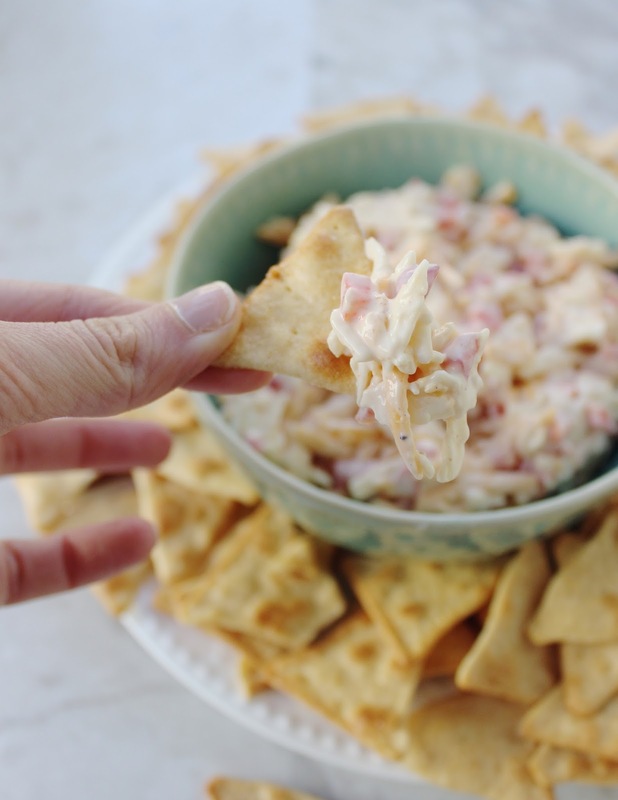 This pimento cheese could be used to make a killer grilled cheese, especially when accompanied by tomato soup--one of my all-time favorite winter meals. As for me, I'll be bringing this classic southern pimento cheese dip to a friend's house to watch the Bachelor tomorrow. It's a silly, sometimes blatantly sexist show, but I enjoy making fun of it with my friends. The Bachelor also provides a great excuse to get together on a Monday night to drink wine and eat cheese dip. Whatever we need to do to make Mondays in January a little more bearable, right? Combine the mayo, pimentos, grated vidalia onion, Worcestershire sauce, salt, pepper, and cayenne in a large bowl. Add the grated cheeses and stir to combine. For optimum favor, refrigerate for a few hours before serving. Can be kept in the fridge for up to 1 week. 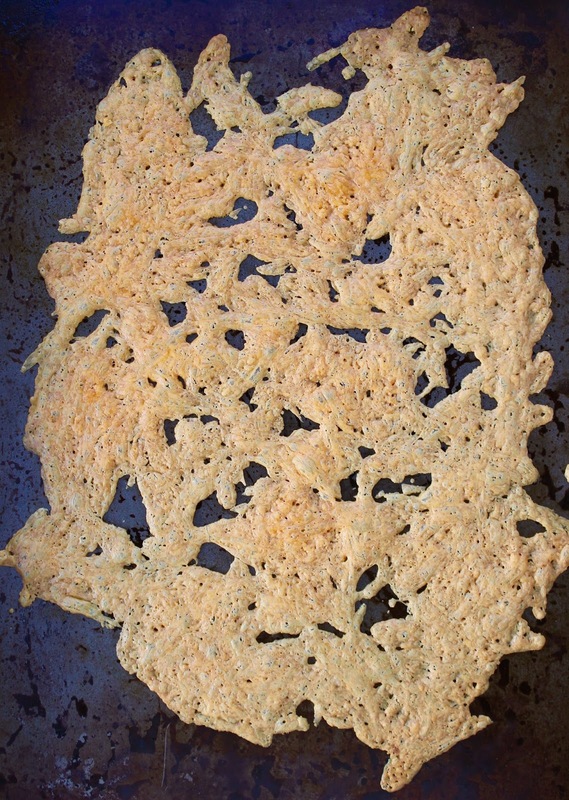 Recipe adapted from The Southerner's Cookbook. I'm generally against restrictive food resolutions for New Year's, just as I'm against diets that totally eliminate any particular food group. Though I know those diets can be helpful for some people, I think they can also be dangerous, in that they make people obsess over food in an unhealthy way. I prefer a more balanced, everything in moderation approach, much like Michael Pollan's philosophy: "Eat food, not too much, mostly plants." 1.) Make more bread at home. 2.) 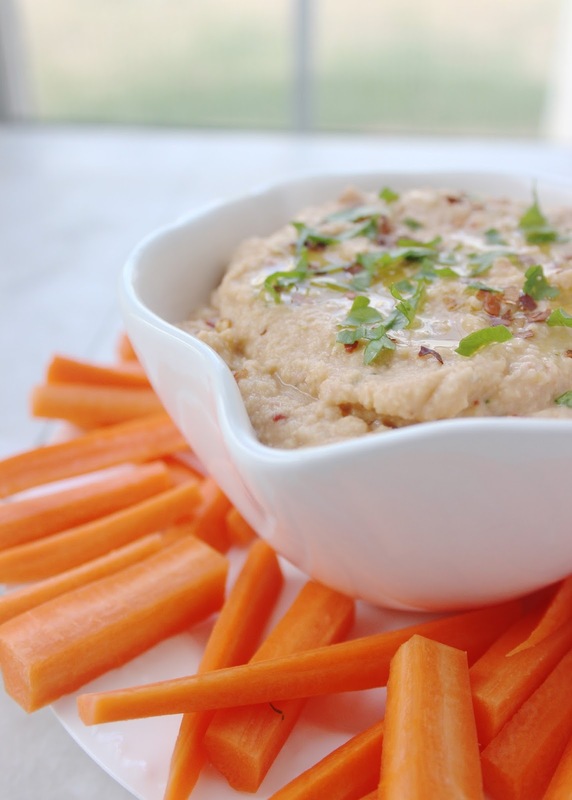 Make more hummus at home. 3.) Eat less refined sugar. #1 was inspired my newfound obsession with no-nead dutch oven bread. 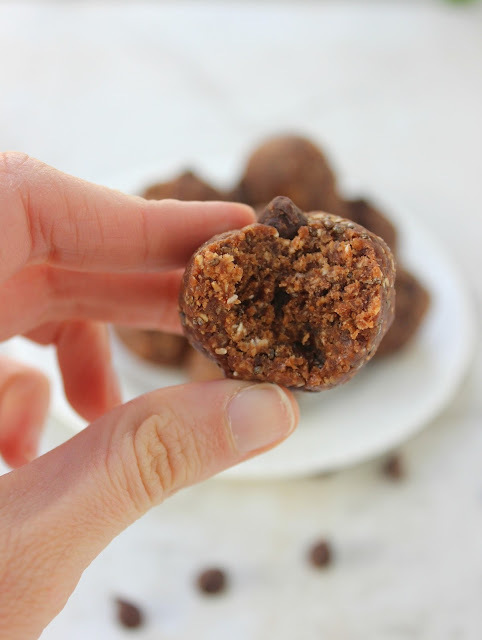 This recipe has been popular on the internet for a while now, but I just got around trying it in December and I am absolutely in love. You'd think this crusty round loaf came from a professional bakery, but you can make it easily in your own kitchen! As the recipe name indicates, it doesn't require any kneading, just 12-18 hours to rise. #3 was inspired by the fact that, probably like most of you, I overindulged on sugar during the holidays. I initially resolved not to eat dessert except on special occasions. This lasted exactly 9 days. Some days, you just absolutely, inexplicably, need chocolate. So, I made these vegan, refined-sugar free, gluten-free brownies (with peanut butter instead of almond butter). They were delicious, and because they're semi-healthy, I'm calling that a win. Finally, #2 was inspired by the fact that I consume an alarming amount of hummus every week. 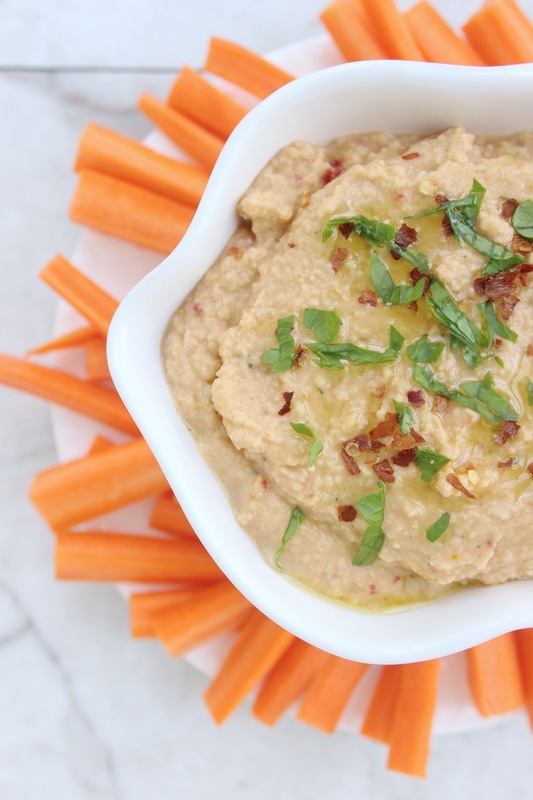 It's such an easy thing to make, and while I love the Trader Joe's hummus, there's no reason I can't make it at home. 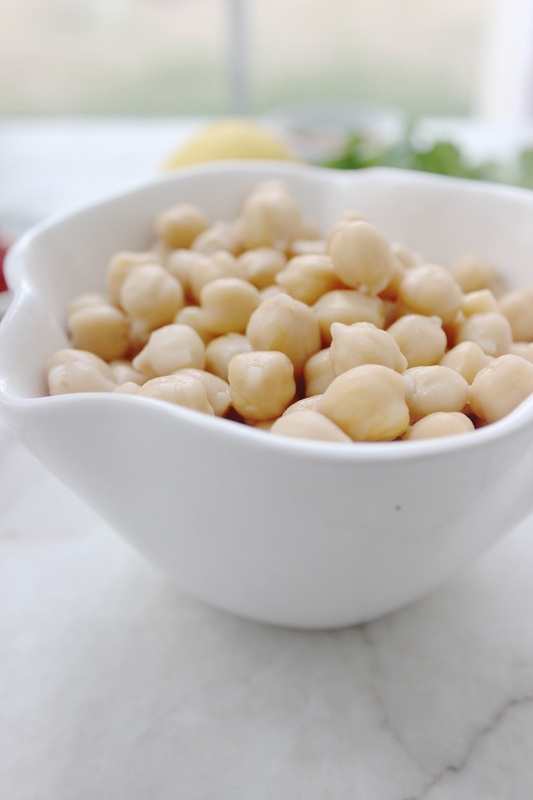 This particular mediterranean variety is smooth, creamy, and savory. 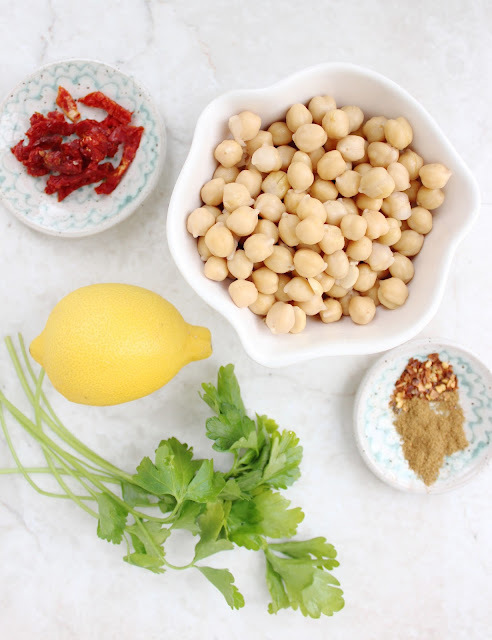 The tahini flavor isn't strong, as it is in other types of hummus, but the other mediterranean flavors like lemon and sun-dried tomatoes really shine. Feel free to mix up the ingredients and topping as you like. Do you have any New Year's food resolutions? Giving up chocolate was a silly idea, right? Add all the ingredients except for the hot water to a food processor. Pulse until smooth. Gradually pour in the hot water while the processor is running. 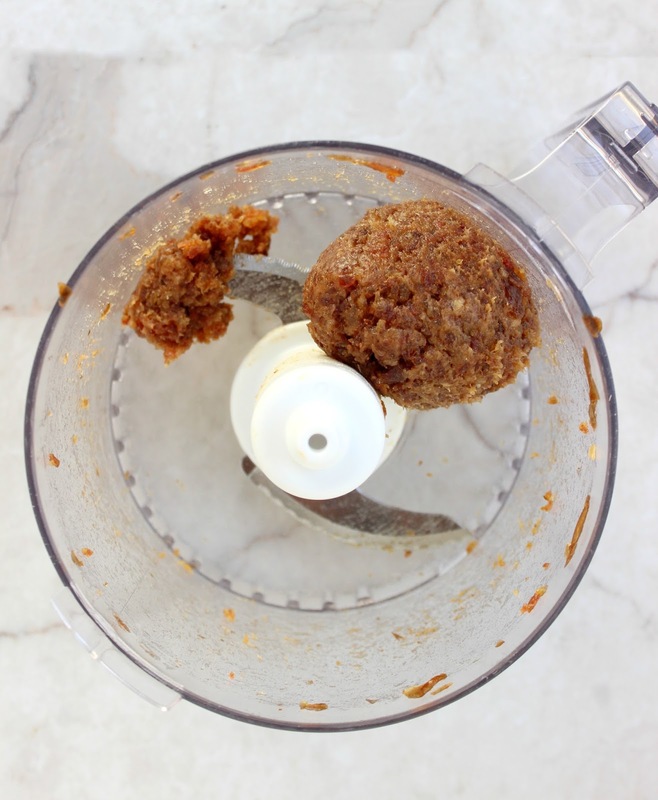 Continue running the food processor until the hummus is creamy and smooth. Chill for a few hours in order for the flavors to set. If desired, serve topped with extra olive oil, fresh parley, and crushed red pepper. I know, surprise, surprise. The blog's first recipe in 2016 is a kale salad. But this isn't just any kale salad. 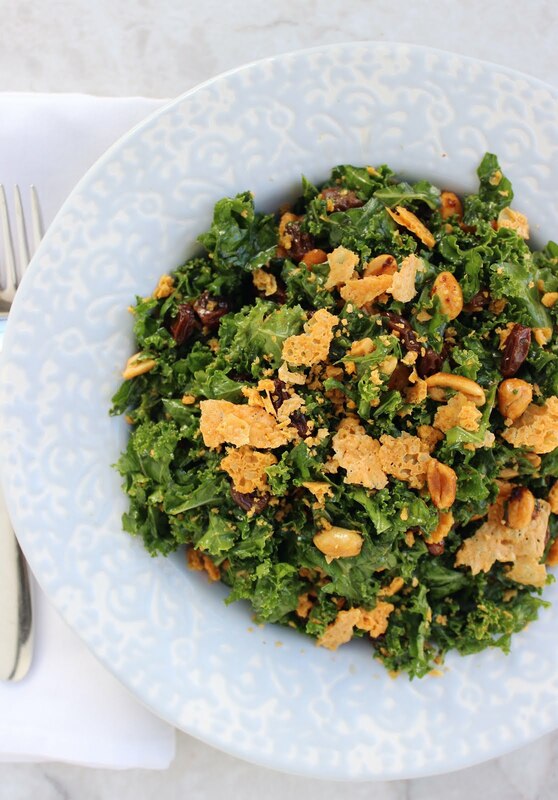 It's a kale salad that tastes like peanut butter and jelly. Yes, really. This kale salad has a taste that actually resembles peanut butter and jelly. The recipe is from one of the many cookbooks I received as Christmas and birthday gifts, Milk Bar Life by Christina Tosi. You may remember that I raved about Christina Tosi a few posts back after finally visiting her bakery, Milk Bar, in D.C. 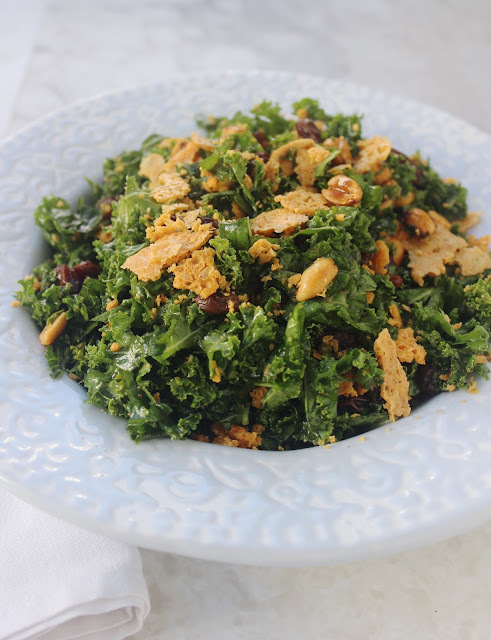 There are lots of fun and retro recipes in Christina's new book, but the one that jumped out at me the most was this recipe for a kale salad that she claimed tasted like peanut butter and jelly. Though I was in disbelief at first, now I totally understand. The PB&J vibe comes from the combination of raisins (which you'll simmer in apple cider to plump up) and--my favorite--roasted peanuts with chili and honey. You'll also slow roast some cheddar cheese until it's hard and can be broken into pieces. (photo above) The crispy cheddar pieces add a salty crunch to the salad like croutons. If you're determined to eat more kale salads in the new year, this salad is a good place to start. It's full of comforting and familiar flavors and is packed with enough protein to power you through the afternoon. Preheat oven to 250. Spread the grated cheddar cheese in a thin layer on a cookie sheet. Bake at 250 for 30-40 minutes in 10 minute intervals. Every ten minutes, rotate the cookie sheet. The cheese will be done when it is hardened and beginning to brown. Remove from the oven and let cool completely. Use a spatula to break up the cheese into small pieces. In a small sauce pan, combine raisins and apple cider. Cook over medium heat for 20 minutes, or until raisins are double in size. Set aside and let cool for 10 minutes. The raisins will continue to absorb the liquid. When cooled, drain the raisins, but reserve 2 tablespoons apple cider for the dressing. Increase oven temperature to 300. In a small bowl, stir together the honey, chili powder, apple cider vinegar, and olive oil. Add peanuts and stir to coat. 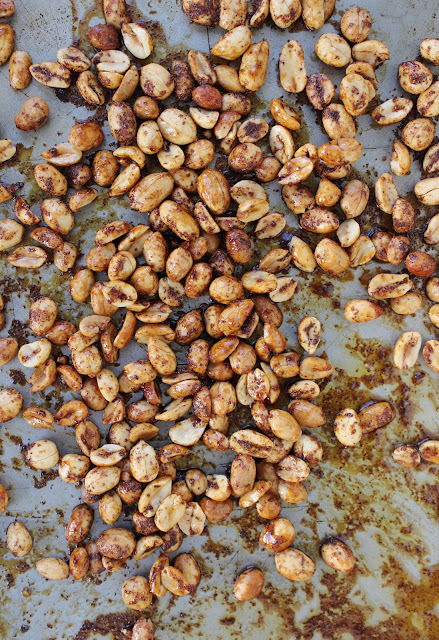 Spread peanuts over a cookie sheet. Bake at 300 for 10-12 minutes or until peanuts are toasted and fragrant. Prepare the kale by stripping the leaves from the stem and cutting into small diagonal strips. Prepare the dressing by whisking together the apple cider, lemon juice, salt and pepper. While whisking, gradually drizzle in the olive oil. Pour dressing over the kale and use your hands to massage the dressing into the leaves. 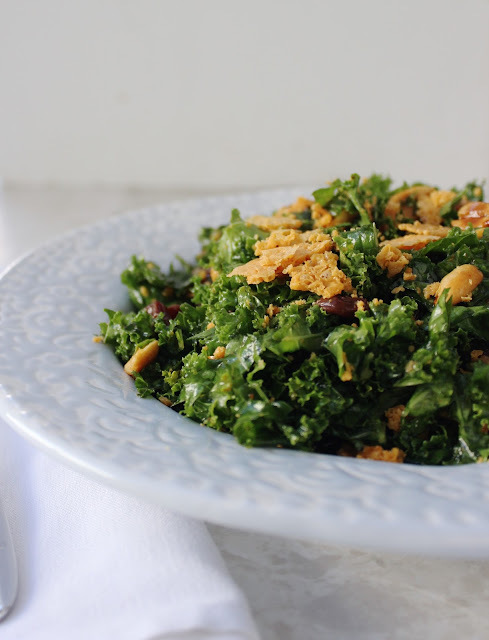 Toss dressed kale with the crispy cheddar, raisins, and chili honey peanuts. Dig in! The salad will also keep well in the fridge for 2-3 days.